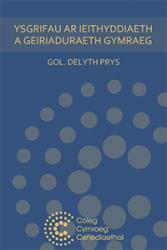 This is the first volume of writings to discuss aspects of linguistics in Welsh to be published for many years, despite the subject’s increasing importance due to the recent growth in status and use of the language. Dylan Phillips, the Coleg Cymraeg’s senior academic manager said: “This volume helps fill part of the huge gap in the field, and is a great boost for students and scholars who are interested in Linguistic and Lexicographical Studies”. The guest speaker at the book launch will be Dafydd Glyn Jones, joint editor of the Welsh Academy Dictionary, and one who has campaigned tirelessly for years to establish the Coleg Cymraeg and strengthen Welsh scholarship within Higher Education in Wales. The book is published on Y Porth, the Coleg Cymraeg’s e-learning platform. It may be freely downloaded as an e-book for Apple and Android apps (in EPUB format), for Kindles (in MOBI format), or as a PDF to be read on a computer screen. Go to https://llyfrgell.porth.ac.uk/media/ysgrifau-ar-ieithyddiaeth-a-geiriaduraeth-gymraeg- if you would like to download a copy.